10:00 AM Planetarium Movie: Zula Patrol Down to Earth Hey Kids! Join us for Zula Patrol as they chase Madam Deliria back through geologic times in an attempt to rid the universe of litter. Animated film. Ages 4 and up. 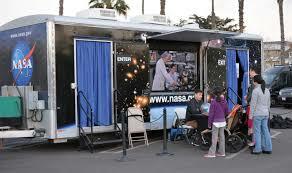 10:00 AM to 4:00 PM: NASA's Destination Station traveling exhibit- This exhibit which is located inside of a 40' truck/ trailer, promotes research opportunities and educates the public about activities and life on-board the international space station. All ages. 10:00 AM to 12:30 PM Astronomy Crafts- It was 48 years ago this month that Apollo 11 landed on the moon. Join us for astronomy crafts as we honor the accomplishment. All ages. 1:00 PM and 4:00 PM Ranger led planetarium programs. All ages. Questions: For Questions about this event, please contact Dana Dierkes with Rock Creek Park at 202-895-6222 or dana_dierkes@nps.gov.